A wonderful chocolate sauce for all types of Wholetarians bringing a nice chocolatey crackle to your frozen treat. A simple chocolate sauce that hardens up when applied to any cold frozen dessert. The secret is in the healthy coconut oil. It can be made in advance and stored in the refrigerator until ready to use. Make sure the coconut oil is in a liquid state. If it is not, measure out 1 cup and slowly warm it up in a small pan on the stove just until liquid. Immediately remove from stove. Blend everything together in a blender until smooth. Transfer chocolate mixture to a small deep bowl or glass an inch or so wider than the popsicle mold. 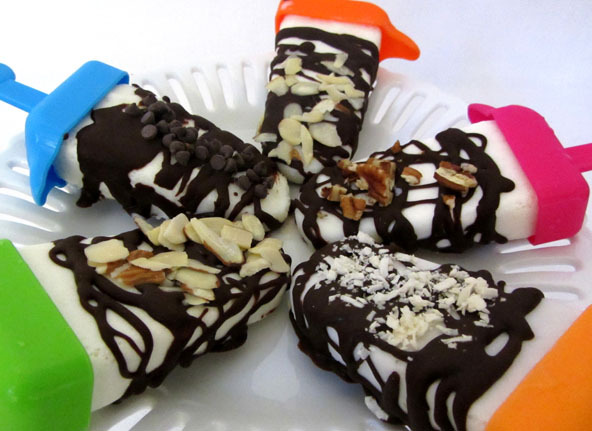 Remove the fudgesicle from the mold, and immediately put on a rimmed cookie sheet lined with parchment paper and put back in the freezer to harden the edges once again. 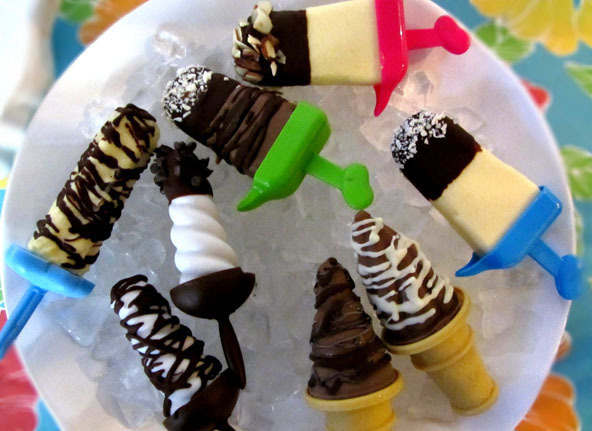 Have everything ready to decorate the popsicles with. Dip the end in the chocolate mixture and then dip in chopped nuts, chopped chocolate chips or chopped dried coconut. 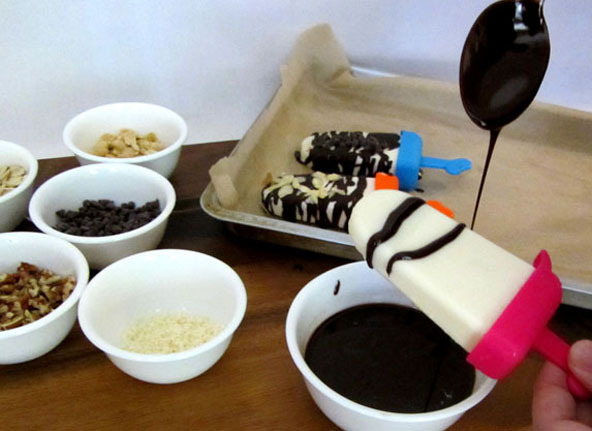 For drizzling it on - Pour the chocolate into a plastic squirt bottle (these are food grade and made just for this type of need) or simply take a spoon of chocolate and drizzle chocolate over the fudgsicle back and forth, turning over the fudgsicle to drizzle on both sides. Let the drippings fall back into the chocolate bowl. The coconut oil in the chocolate sauce will harden up immediately when it gets cold. Eat immediately or place on a cookie sheet lined with parchment paper and place back in the freezer until ready to serve. Next time I will use a plastic squirt bottle to drizzle the chocolate on. It would make it prettier.